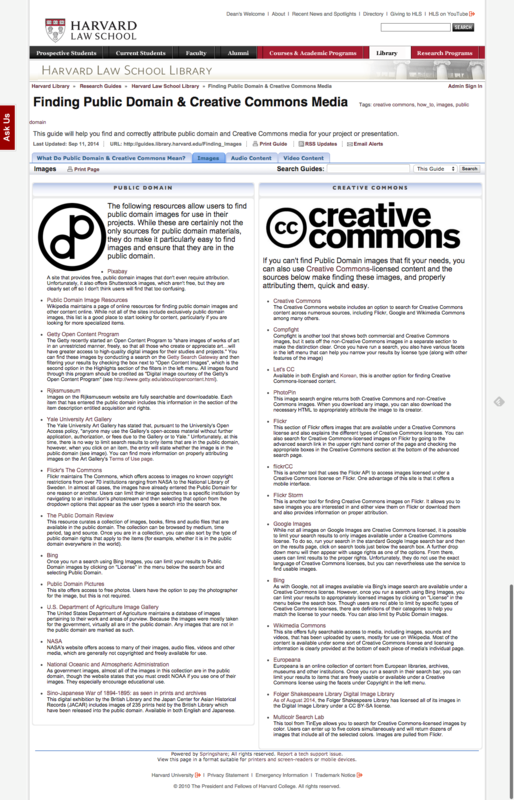 Today I wanted to feature this great guide to finding Public Domain & Creative Commons Media created by Carli Spina at Harvard Law School library. Its main feature is a good list of sites that have open access images making it easy to find material you can freely use in your research or teaching. I was happy to see some of my personal favourites included like Flickr Commons for historical photographs and the Rijksmuseum for reproductions of old masters artwork. This entry was posted in Digital Resources and tagged Open Access by Sarah Severson. Bookmark the permalink.